In the last few weeks have seen that Large cap stocks have not seen follow up buying as there is not much of index support. But many of such moves have first dipped and then zoomed up. So many a times stock give a breakout jump a 5% and then dip back to lower levels testing and even breaking breakout levels before starting on the real move. Learn the same after missing out on the big trades in following stocks. 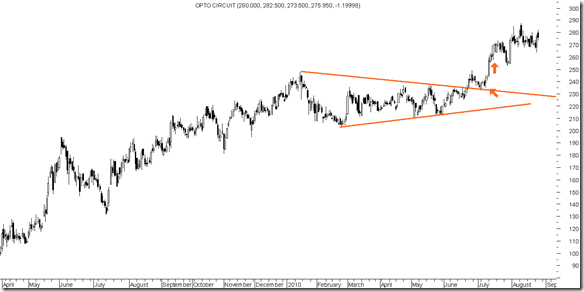 Opto Circuits booked at nominal gains and stock ended up 10-15% higher. 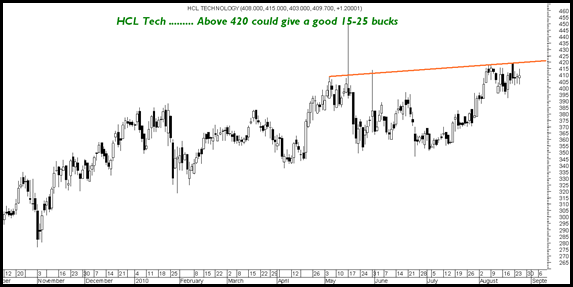 Some Stocks that look bullish after giving False Starts …. Piramal Healthcare after giving a quick move from 512 to 532 the stock is back to 500 giving a false start. The stock could now test patience for next few sessions. If holds 490-495 then could expect a recovery. If sustains below 493 for 10-15 mins one could take a chance of selling and re-entering at 470-475. After a few sessions would expect the stock to be back on its way to a target of 540/580 in 1-2 mths time frame. 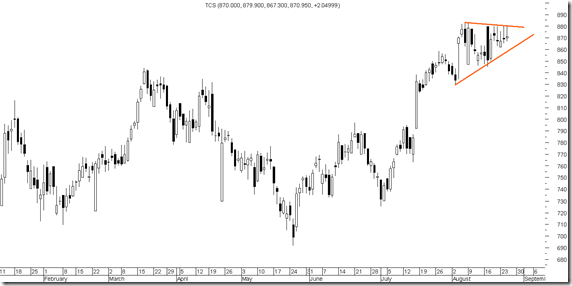 ACC after a sharp move from 855 to 885 has dipped. Can start a new move in next few sessions. Aditya Birla Nuvo another false mover. Luckily here we bought at 830 and sold at 850. Looks interesting if dips to 810.
suzlon stock movement is beyond ubderstanding as its market wide position limit MWPL remains very high most time there is ban trading in derivatives when 95 percent limit is reached.cash delivery percentage is not bad .all negatives news are factored in.liquidity in options is not there.investors trapped at higher levels want to sell at their cost there seems to be some game plan in the stock.can you kindly offer some deep thoughts on the stock. I bought Sep futures @ 520 post your reco yesterday. Now you’ve reported a false start case. Kindly suggest if i should hold it or book a loss at these levels. Would holding until Sep expiry recover my cost? The stock has hit the stoploss and if you are taking futures if u have the apetite to see 470 then i expect the stock to turnaround from those levels. Piramal Health stock is holding at around 495-497. Any new opinions on this one? Do you still maitain it to go to 470 in the coming days. Today market is down, but Piramal is up. I bought Sep futures of Piramal Health @ 520 post your reco yesterday. Now you’ve reported a false start case. Kindly suggest if i should hold it or book a loss at these levels. Sir what is the stoploss in lincoln pharma and ansal buildwell ? What is your view on Resurgere Mines & Minerals India Limited . Even after posting good result, there is hevy sell off in this counter. I have short to medium term investment horizon. What is ideal buy/stop loss/target price ? Please advise me regarding my position in Punj lloyd. I bot Punj Sep future at 118. It is trading at 111.5 now. Could you please suggest any stoploss. I am holding 3 lots. I am your paid member from almost 3 years now (same time when I started to learn trading). I have tried more than 25 technical analysts/tips services and trust me you are the best out of all. ! So accurate so perfect that at times I am surprised. You have changed the image of so call speculation and turned it into calculations. No matter where the market is we always earn money or save money(by keeping cash position) by your and uncle’s guidance. However, lately there are so many stoploss hits and wrong calls are there that I WONDER WHETHER YOU ARE ISSUING THESE CALLS OR YOUR STAFF IS..(WHICH IS 100% Not as accurate and as good as you are)…they are right at times but you are the best.. 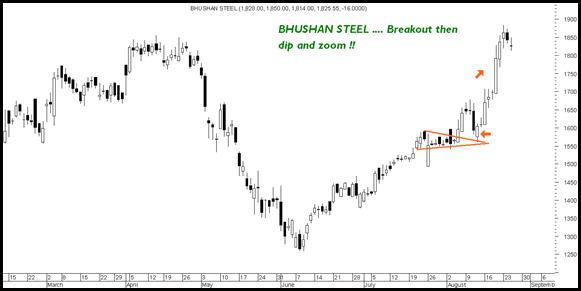 I do understand there are false breakouts and stop loss gets hit but why now ?? I am seeing your service from 3 years and I can’t expect more than this and much better than this. I guess in past 3 years market showed many times of phases (may not be all) but all of a sudden so many false breakouts/stoploss hits? I am not saying because I lost money by those calls ( I have earned so many times by your wonderfull calls that this is immaterial and no one can control market).. I couldn’t understand the latest NIFTY CALL PUT Strategy…you made us exited the same .. although stoploss wasn’t hit. It appears its confirmation that market may fall and hence it would have been better if we would have just squared call and kept the put..afterall thats how the premium would have increased ? Although you are the best person cos last two NIFTY call put strategies rocked.! If you are doing the analysis and issuing the calls then please ignore all of this but if its your staff then please 🙂 you need to teach them again…….You are still my ideal technical analyst and will remain so !!!!! In the last 2 weeks the markets have been very sluggish with false moves which i explained in the previous post. All the trades in Advisory services are given by me. 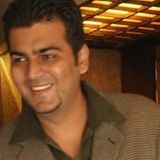 Only Intra Calls are given by Shams as he has the analytical skills to do so. Well in trading we may have stoplosses. The last week had 4-5 stop hits on a trot ! which has been a surprise to me too. Also all we need to keep check is stoplosses are small. For now all stoploss hits have been in range of 2-3.5% but the winners have been big ones. So till we maintain this on net basis the performance for the portfolio will do good. Actually the stocks which we have done the moves have been bigger in this period. Like Camlin,Autoline inds, motherson sumi and some like United Phos, Piramal a few others have hit stops but in range of 2-4%. Hope i believe Rahul you are not using high leverage as 2-4% losss trades should not be a bother where winners are 15-35%.If you are then do avoid leverage. For Nifty Call Put it was a straddle which i expected the time period of trade to be 1-2 weeks only as Volatility levels could spike which it did not to an extent expected. Also time value over the weekend could have hit us. Although within minutes of our trade closure at a small loss the strategy turned profitable. I’d like to share the story of my BIG loss in PIRAMAL HEALTH. On the day you suggested to buy it, i bought one futures lot at 520. Next day, a false start message was posted on your website. The stock came down heavily in the next 2 days. You including other brokers (sharekhan) suggested that the delivery support was at 493, below which it could go down to 470. At this time the futures was around 494. I panicked since my hardearned money was at stake and squared my position at this price. In the meantime, over the weekend, you had replied to me on this post saying if i have appetite to see 470 then i should hold. I thought since two experts (you and sharekhan) suggested that the stock will definitely go down, i sold one futures lot at 494 assuming i will recover some losses when it goes down. God! why did you make me do so! …& it is today (2 days hence) that the futures again went up to 519.9. I again panicked and was forced square off at 517 to limit losses. I lost abt 22K in a week. This is how normal investors like me loose money on hearsay. How would you analyse my case and what do you suggest normal investors like me? One tip i know is “Have strict stoplosses”. Is there anything else that forms part of any learning. Its a classic case of Leverage and Speculation !! The stock moved from 515 to 485 which is a drop of 30 rs max is 6%. We have advised holding to people who have patience and also sent a note for fresh buying today to our clients for certain reasons. If a drop of 6% gives you a big loss implies you better keep your trading style in check. Utmost many a times i have mentioned that leverage is not to be used by Small Investors !! For the record we strictly avoid Futures in our Portfolio Management :). I would urge others to read the above comment and dont make a mistake similarly.